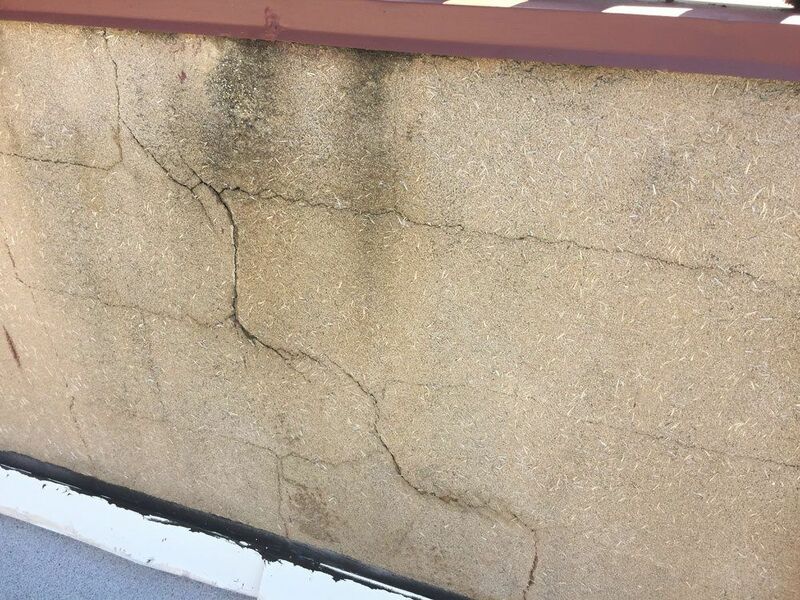 Scuppers flat roof repair – The cause of a major leak was due to incorrect leader headers on the other side of the wall. 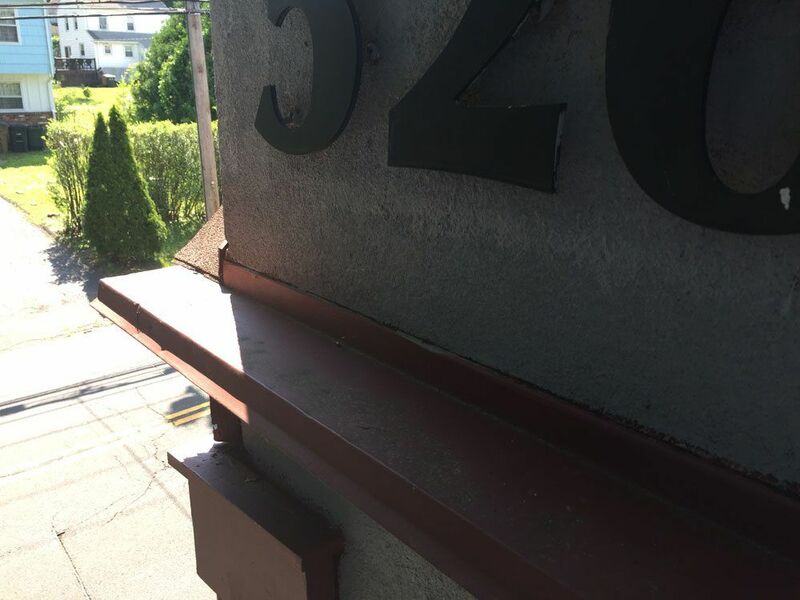 Scuppers are perfect for getting water off a roof, but if water flow is restricted and water backs up into the scupper again, that will cause leaks. Here is the Merriam Webster definition for SCUPPER. 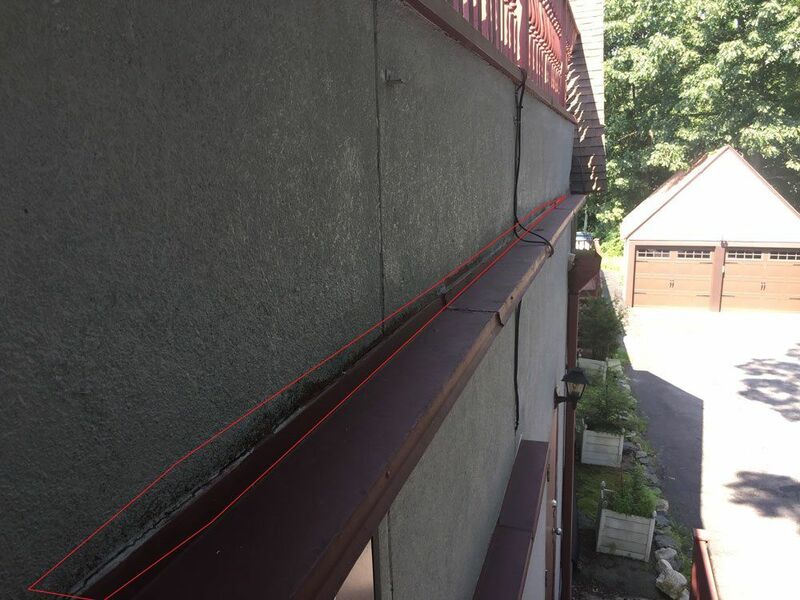 Scuppers Flat Roof Repair – This image shows what the scupper opening at the bottom. There are 2 of these scuppers on the same wall. There are several issues we have found that causes leaks around these scuppers. 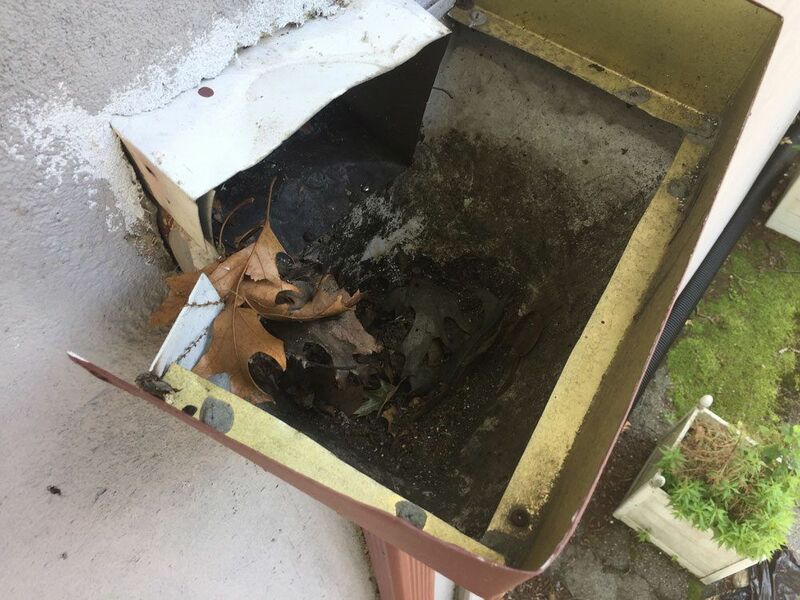 Besides the scupper at the bottom of the image, also notice the stucco has deteriorated, and the cement block is showing through. 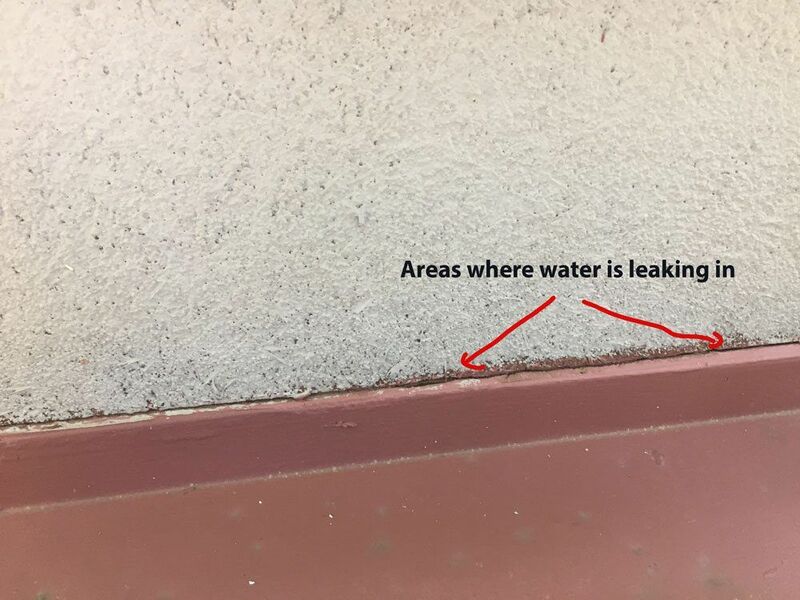 The cracks on the wall will cause leaks, and it will appear in the roof. The image shows the wall where the scuppers exit into the leader headers. All the water from the flat roof of the other side of the wall drains through these scuppers and leader headers. Debris washes through the scuppers into the leader headers. 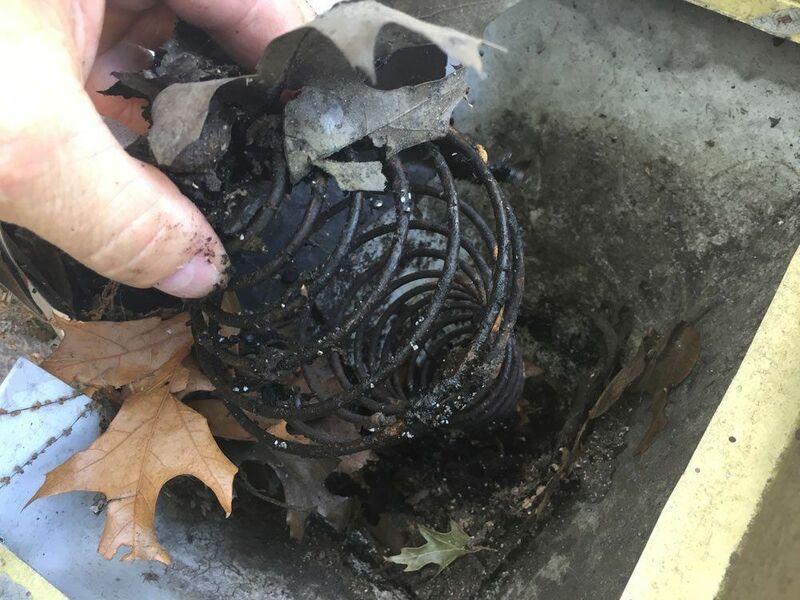 The strainers catch all the debris causing a blockage. Someone has added an extension to the leader header making it higher than the scupper, compromising the emergency overflow in case the drain pipe got blocked. Scuppers are not sealed properly to the wall – water will leak in easily. No strainers on the inside of the wall to prevent debris flowing through the scuppers blocking the drain pipe. When a leader header gets blocked with debris, it will separate from the wall causing water to flow down the wall instead of overflowing the rim of the leader header. Scuppers and leader headers have to work together. A leader header should always be lower than the scupper. If the drain pipe gets blocked or debris gets stuck in the leader header, then water backing up can spill over the leader header instead of pushed back into the scupper and the wall. 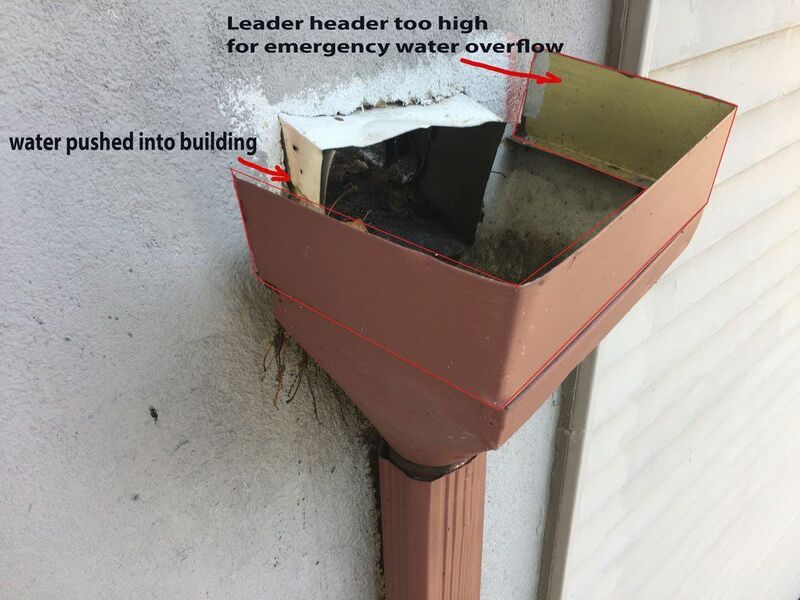 In the image, the scupper is not sealed to the wall and therefore when the blocked leader header fills with water, the water leaks into the wall around the scupper. In the image notice, the extension piece added on top of the leader header. When water backs up, it forces the water into the wall and the through the scupper onto the roof. The strainer or filter in the images was placed in the neck of the leader header, causing to clog fast with a small amount of debris. Because of this, water backs up onto the flat roof through the scupper. The extension on the leader header added to more problems. Scuppers and leader headers get filled with debris very fast. If the scupper were letting the water of the roof without a leader header to catch the water, then it would be fine because the debris will get washed off the roof. 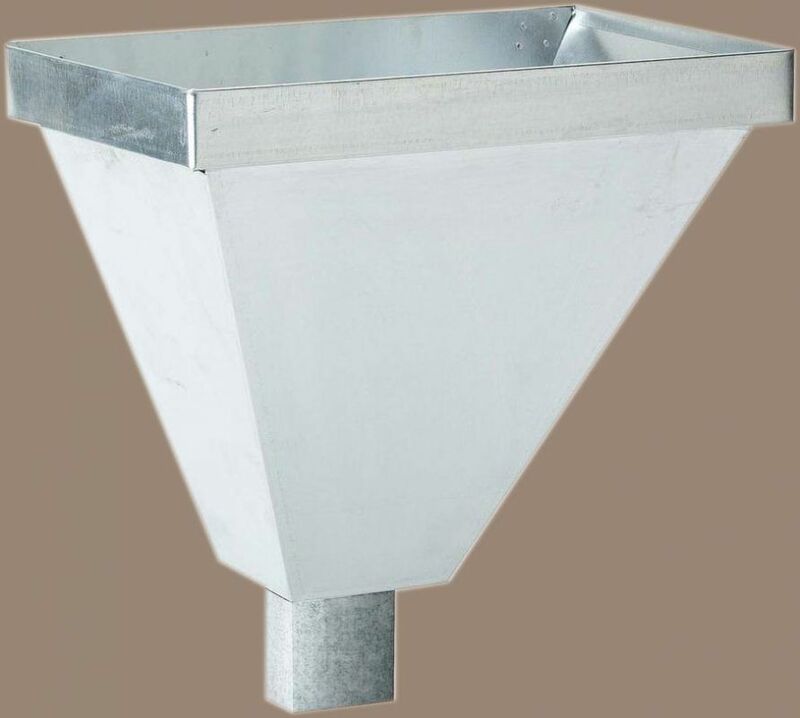 Since there is a leader header funneling all the water into a drain pipe, then it is important to have a strainer to the mouth of the scupper. Strainers should allow small debris through and stop twigs and leaves. When water was backing up due to a blocked drain pipe, the water then was forced onto the wall into the flashing. With a heavy rain hitting the wall this would also cause a leak. 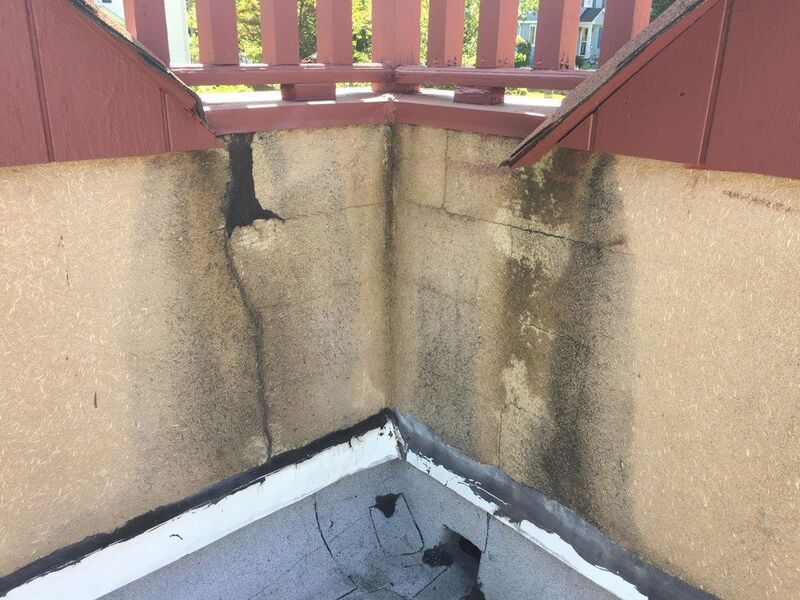 Flat roof repairs always have to do with draining systems. 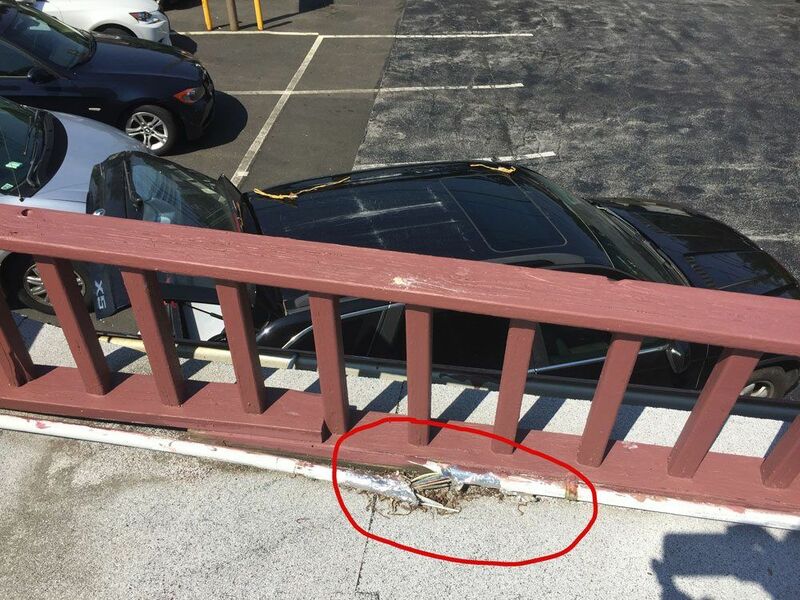 Make sure when you have your flat roof repaired that the drains get particular attention. Flashing above scupper is not properly attached to the wall. This also causes leaks. 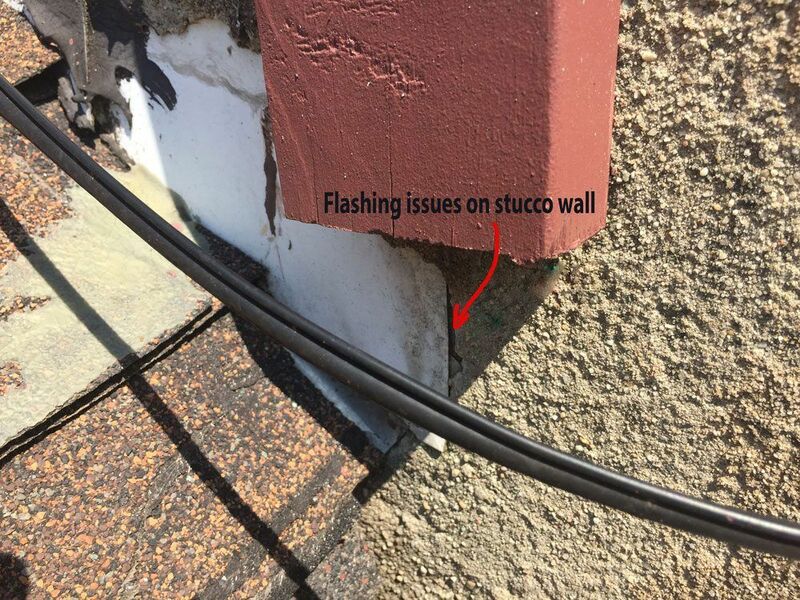 In the image, the flashing is not sealing properly into the stucco wall. With a heavy rain blowing onto the wall, water will leak into the building. 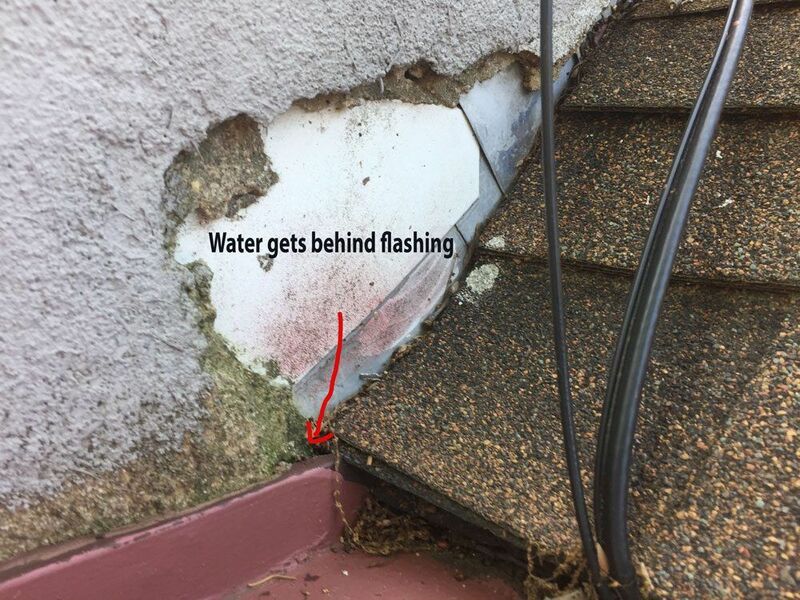 A closer look at the flashing shows where water is leaking in. The stucco on the wall has deteriorated and caused the cement block to crack. This is just another issue on the flat roof where water leaks on. Flashing on the wall need re-installing, because water can leak through that area. Flashing on a flat roof makes or breaks a roof. All the issues in the images above have to do with flashing. Most workers do not pay close attention to flashing and cause more harm than good. 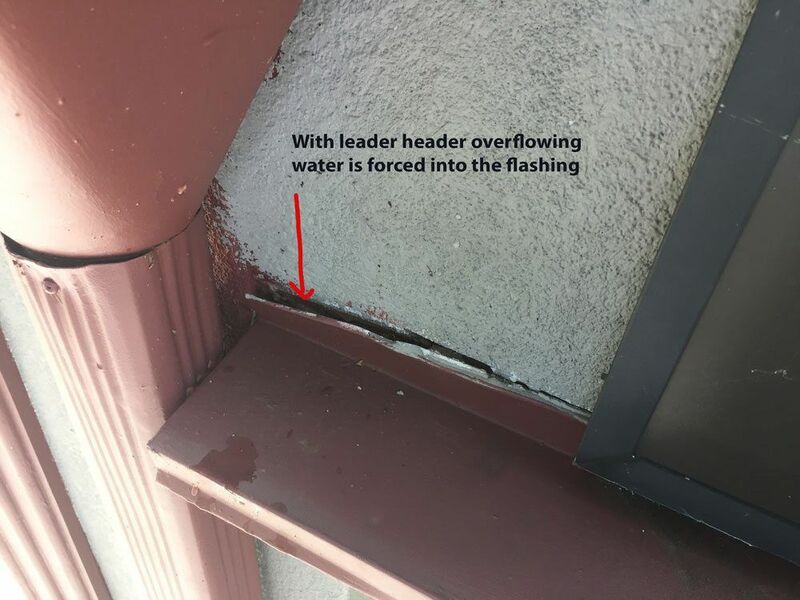 Most roofs and leaks are due to flashing not properly done. For the most part, it is inexperienced people trying to do a job. The other reason is that they under bid a job and try to seal it with caulking or something and hope to get away with it. 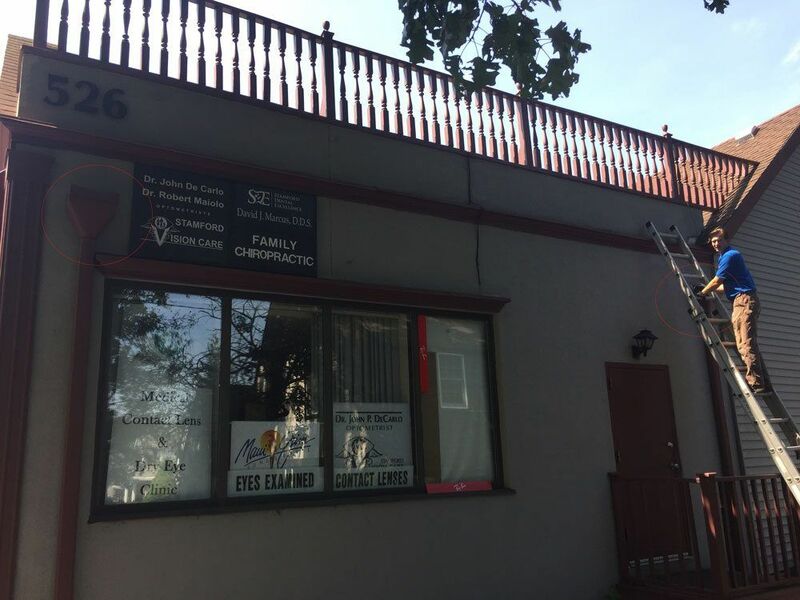 If you got this far reading and looking at all the issues we have mentioned, you might want to take care of this electrical wire that open.